Alsadat Hashemipour, M., Fatah, F., Ashraf, M., Tahmasebi, M. (2016). Expression of Human Kallikreins 4, 8, 10, 11 and 13 in Pleomorphic Adenomas and Mucoepidermoid Carcinomas. Iranian Journal of Pathology, 11(4), 334-344. Maryam Alsadat Hashemipour; Fatemeh Sadat Fatah; Mohammad Javad Ashraf; Mehrnaz Tahmasebi. "Expression of Human Kallikreins 4, 8, 10, 11 and 13 in Pleomorphic Adenomas and Mucoepidermoid Carcinomas". 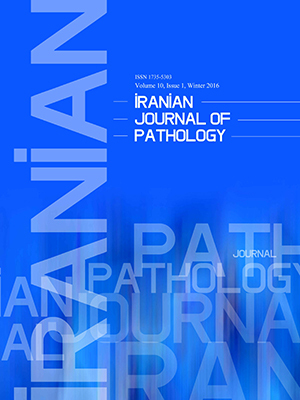 Iranian Journal of Pathology, 11, 4, 2016, 334-344. Alsadat Hashemipour, M., Fatah, F., Ashraf, M., Tahmasebi, M. (2016). 'Expression of Human Kallikreins 4, 8, 10, 11 and 13 in Pleomorphic Adenomas and Mucoepidermoid Carcinomas', Iranian Journal of Pathology, 11(4), pp. 334-344. Alsadat Hashemipour, M., Fatah, F., Ashraf, M., Tahmasebi, M. Expression of Human Kallikreins 4, 8, 10, 11 and 13 in Pleomorphic Adenomas and Mucoepidermoid Carcinomas. Iranian Journal of Pathology, 2016; 11(4): 334-344. Background: In cancers of prostate, breast, oropharynx, lung, hypopharynx and skin, human tissue kallikreins has been demonstrated as a main role in these problems. There are many research works in which some human tissue kallikreins are expressed in salivary glands. In the present study, the main goal was to determine expression of human tissue kallikreins 4, 8, 10, 11 and 13 in pleomorphic adenomas and mucoepidermoid carcinomas. Methods: Sixty-six specimens (45 cases of pleomorphic adenomas and 21 cases mucoepidermoid carcinomas) were selected for final analysis by immunohistochemistry. For doing association test, clinical parameters obtained from the patients’ medical charts, which included age, gender were used and the nonparametric tests employed for statistical analyses. Results: The expression of human kallikreins 4, 8, 11 and 13 was more prominent in benign and malignant tumors compared to that in normal tissues and the difference was significant. In addition, the expression of human kallikreins 4, 8, 10 and 11 in malignant tumors was more than that in benign tumors, with statistically significant differences. Conclusion: The differences in the levels of human kallikreins 4, 8, 11 and 13 suggest that kallikreins may benefit in determining tumor behavior of salivary gland tumors. Hashemipour MS, Zarei MR, Chamani G, Rad M. Malignant salivary glands tumors in Kerman province: a retrospective study. DRJ 2007;4:4-10. Koivunen P, Suutala L, Schorsch I, Jokinen K, Alho OP. Malignant epithelial salivary gland tumors in Nourth Finland: Incidence and clinical characteristics. Eur Arch Otorhinolaryngo 2002;259:146-49. Seifert G, Sobin LH. Histological typing of salivary gland tumors. World Health Organization international histological classification of tumours. 2nd ed. New York: Springer-Verlag, 1991. Akrish S, Peled M, Ben-Izhak O, Nagler RM. Malignant salivary gland tumors and COX-2: A histopathological and immunohistochemical analysis with implications on histogenesis. Oral Oncol 2009;45: 1044-1050. Kiyoshima T, Shima K, Kobayashi I, Matsuo K, Okamura K, Komatsu S, et al. Expression of p53 tumor suppressor gene in adenoid cystic and mucoepidermoid carcinomas of the salivary glands. Oral Oncol 2001;37:315-22. Darling MR1, Jackson-Boeters L, Daley TD, Diamandis EP. Human kallikrein 6 expression in salivary gland tumors. J Histochem Cytochem 2006;54:337-42. Magklara A, Scorilas A, Katsaros D, Massobrio M, Yousef GM, Fracchioli S, et al. The human KLK8 (neuropsin/ovasin) gene: identification of two novel splice variants and its prognostic value in ovarian cancer. Clin Cancer Res 2001;7:806-11. Kishi T, Grass L, Soosaipillai A, Scorilas A, Harbeck N, Schmalfeldt B.Human kallikrein 8, a novel biomarker for ovarian carcinoma. Cancer Res 2003;63:2771-74. Yousef GM, Polymeris ME, Yacoub GM, Scorilas A, Soosaipillai A, Popalis C, et al. Parallel overexpression of seven kallikrein genes in ovarian cancer. Cancer Res 2003;63:2223–27. Yousef GM, Yacoub GM, Polymeris ME, Popalis C, Soosaipillai A, Diamandis EP.. Kallikrein gene downregulation in breast cancer. Br J Cancer 2004; 90:167–72. Darling MR, Tsai S, Jackson-Boeters L, Daley TD, Diamandis EP. Human kallikrein 3 (prostate specific antigen) and human kallikrein 5 expression in salivary gland tumors. Int J Biol Markers 2006;21:201-5. Diamandis EP, Yousef GM. Human tissue kallikreins: a family of new cancer biomarkers. Clin Chem 2002;48:1198-205. Hashem NN, Mara TW, Mohamed M, Zhang I, Fung K, Kwan KF, et al. Human kallikrein 14 expression in salivary gland tumors. Int J Biol Markers 2010;25:32-7. E. Immunoperoxidase technique in histopathology: applications, methods, and controls. J Clin Pathol 1979; 32: 971–978. Eveson JW, Auclair P, Gnepp DR. Salivary gland tumours. In: Barnes L, Eveson JW, Reichart P, Sidransky D, eds. World Health Organization Classification of Tumours. Pathology and genetics of head and neck tumours. Lyon: IARC Press 2005;209-82. Ellis GL, Auclair PL. Atlas of tumor pathology. Tumors of the salivary glands. 3rd ed. Washington, DC: Armed Forces Institute of Pathology 1996. Anisowicz A, Sotiropoulou G, Stenman G, Mok SC, Sager R. A novel protease homolog differentially expressed in breast and ovarian cancer. Mol Med 1996;2:624–36. Petraki CD, Gregorakis AK, Papanastasiou PA, Karavana VN, Luo LY, Diamandis EP. Immunohistochemical localization of human kallikreins 6, 10 and 13 in benign and malignant prostatic tissues. Prostate Cancer Prostatic Dis 2003;6:223–27. Petraki CD, Karavana VN, Skoufogiannis PT, Little SP, Howarth DJ, Yousef GM, Diamandis EP. The spectrum of human kallikrein 6 (zyme/protease M/neurosin) expression in human tissues as assessed by immunohistochemistry. J Histochem Cytochem 2001;49:1431–41. Allred DC, Clark GM, Elledge R, Fuqua SA, Brown RW, Chamness GC, et al. Association of p53 protein expression with tumor cell proliferation rate and clinical outcome in node-negative breast cancer. J Natl Cancer Inst 1993:85:200–6. Tuck AB, O'Malley FP, Singhal H, Harris JF, Tonkin KS, Kerkvliet N, et al. Osteopontin expression in a group of lymph node negative breast cancer patients. Int J Cancer 1998;79:502-8. Borgono CA, Diamandis EP. The emerging roles of human tissue kallikreins in cancer. Nat Rev Cancer 2004;4:876–90. Stamey TA, Yang N, Hay AR, McNeal JE, Freiha FS, Redwine E. Prostate-specific antigen as a serum marker for adenocarcinoma of the prostate. N Engl J Med 1987;317:909–16. Diamandis EP, Yousef GM, Luo LY, Magklara A, Obiezu CV.. The human kallikrein gene family-implications in carcinogenesis. Trends Endocrinol Metab 2000;11:54–60. Obiezu CV, Diamandis EP. Human tissue kallikrein family: applications in cancer. Cancer Lett 2005;224:1-22. Kapadia C1, Chang A, Sotiropoulou G, Yousef GM, Grass L, Soosaipillai A, et al. Human kallikrein 13: production and purification of recombinant protein and monoclonal and polyclonal antibodies, and development of a sensitive and specific immunofluorometric assay. Clin Chem2003;49:77–86. Scorilas A, Borgoño CA, Harbeck N, Dorn J, Schmalfeldt B, Schmitt M, Diamandis EP.Human kallikrein 13 protein in ovarian cancer cytosols: a new favorable prognostic marker. J Clin Oncol 2004;22:678–85. Adib TR, Henderson S, Perrett C, Hewitt D, Bourmpoulia D, Ledermann J, Boshoff C.. Predicting biomarkers for ovarian cancer using gene-expression microarrays. Br J Cancer 2004;90, 686–92. Petraki CD, Karavana VN, Diamandis EP. Human kallikrein 13 expression in normal tissues: an immunohistochemical study.J Histochem Cytochem 2003;51:493-501. Darling MR, Jackson-Boeters L, Daley TD, Diamandis EP. Human kallikrein 13 expression in salivary gland tumors. Int J Biol Markers. 2006;21:106-10. Cané S, Bignotti E, Bellone S, Palmieri M, De las Casas L, Roman JJ, et al. The novel serine protease tumor-associated differentially expressed gene-14(KLK8/Neuropsin/Ovasin) is highly overexpressed in cervical cancer. Am J Obstet Gynecol2004;190:60–6. Zhang Y, Bhat I, Zeng M, Jayal G, Wazer DE, Band H, Band V. Human kallikrein 10, a predictive marker for breast cancer. Biol Chem;387:715–21. Darling MR, Hashem NN, Zhang I, Mohamed AB, Fung K, Kwan K, et al. Kallikrein-related peptidase 10 expression in salivary gland tissues and tumours. Int J Biol Markers 2012 27;27:e381-8. Obiezu CV, Michael IP, Levesque MA, Diamandis EP. Human kallikrein 4: enzymatic activity, inhibition, and degradation of extracellular matrix proteins. Biol Chem 2006;387:749–59. Yousef GM, Chang A, Scorilas A ,Diamandis EP: Genomic organization of the human kallikrein gene family on chromosome 19q13.3-q13.4. Biochem Biophys Res Commun 2000;276:125-133. Komatsu N, Saijoh K, Toyama T, et al: Multiple tissue kallikrein mRNA and protein expression in normal skin and skin diseases. Br J Dermatol 2005;153:274-281. Nakamura T, Mitsui S, Okui A, et al: Alternative splicingisoforms of hippostasin (PRSS20/KLK11) in prostate cancer cell lines. Prostate 2001;49:72-8. Shigemasa K, Gu L, Tanimoto H, O'Brien TJ, Ohama K: Human kallikrein gene 11 (KLK11) mRNA overexpression is associated with poor prognosis in patients with epithelial ovarian cancer. Clin Cancer Res 2004;10:2766-2770. Bhattacharjee A, Richards WG, Staunton J. Classification of human lung carcinomas by mRNA expression profiling reveals distinct adenocarcinoma subclasses. Proc Natl Acad Sci USA 2001;98:13790-95. Veveris-Lowe TL, Lawrence MG, Collard RL, Bui L, Herington AC, Nicol DL, et al. Kallikrein 4 (hK4) and prostate-specific antigen (PSA) are associated with the loss of E-cadherin and an epithelial-mesenchymal transition (EMT)-like effect in prostate cancer cells. Endocr Relat Cancer. 2005;12:631-43. Regezi JA, Zarbo RJ, Batsakis JG. Immunoprofile of mucoepidermoid carcinomas of minor salivary glands. Oral Surg Oral Med Oral Pathol. 1991;71:189-92. Ole-MoiYoi OK, Pinkus GS, Spragg J, Austen KF. Identification of human glandular kallikrein in the beta cell of the pancreas. N Engl J Med. 1979;300:1289-94. Luo LY, Katsaros D, Scorilas A, Fracchioli S, Piccinno R, Rigault de la Longrais IA, et al.Prognostic value of human kallikrein 10 expression in epithelial ovarian carcinoma. J Histochem Cytochem. 2003;51:493-501.